Poleetical cairt: the Kashmir region districts, shawin the Pir Panjal range an the Kashmir valley or Vale o Kashmir. Kashmir is the northrenmaist geografical region o the Indie subcontinent. Till the mid-19t century, the term "Kashmir" denotit anly the Kashmir Valley atween the Great Himalayas an the Pir Panjal moontain range. The day, it denotes a lairger aurie that includes the Indie-admeenistered territory o Jammu an Kashmir (subdividit intae Jammu, Kashmir, an Ladakh diveesions), the Pakistani-admeenistert territories o Azad Kashmir an Gilgit-Baltistan, an Cheenese-admeenistert territories o Aksai Chin an the Trans-Karakoram Tract. ↑ "Kashmir: region, Indian subcontinent". Encyclopaedia Britannica. Retrieved 16 July 2016. Quote: "Kashmir, region of the northwestern Indian subcontinent. It is bounded by the Uygur Autonomous Region of Xinjiang to the northeast and the Tibet Autonomous Region to the east (both parts of China), by the Indian states of Himachal Pradesh and Punjab to the south, by Pakistan to the west, and by Afghanistan to the northwest. The northern and western portions are administered by Pakistan and comprise three areas: Azad Kashmir, Gilgit, and Baltistan, ... 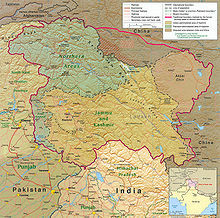 The southern and southeastern portions constitute the Indian state of Jammu and Kashmir. The Indian- and Pakistani-administered portions are divided by a “line of control” agreed to in 1972, although neither country recognizes it as an international boundary. In addition, China became active in the eastern area of Kashmir in the 1950s and since 1962 has controlled the northeastern part of Ladakh (the easternmost portion of the region)." ↑ "Kashmir territories profile". BBC. Retrieved 16 July 2016. Quote: "The Himalayan region of Kashmir has been a flashpoint between India and Pakistan for over six decades. Since India's partition and the creation of Pakistan in 1947, the nuclear-armed neighbours have fought three wars over the Muslim-majority territory, which both claim in full but control in part. Today it remains one of the most militarised zones in the world. China administers parts of the territory." ↑ "Kashmir profile — timeline". BBC. Retrieved 16 July 2016. Quote: "1950s – China gradually occupies eastern Kashmir (Aksai Chin). 1962 – China defeats India in a short war for control of Aksai Chin. 1963 – Pakistan cedes the Trans-Karakoram Tract of Kashmir to China." This page wis last eeditit on 15 Februar 2018, at 00:34.